One thing about coming over on Sunday and giving oursleves 2 days to set up means we are more relaxed and will be ready with plenty of time to spare. It is going to make the world of difference to our very existance. I even managed to go shopping yesterday. Leisurely breakfast this morning at a little place we found where the coffee is almost as good as Ian's and the service wonderful. Excellent news that Team NZ won the 2nd race of America's Cup so fingers crossed for tonight. 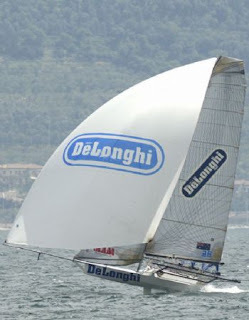 Ian was asleep during the second race when we presumed they had lost and I was dozing off when I heard the commentator say something about Alinghi being behind. Woke up in a flash. Also can report that I have completed 2 of my TAST stitches so only 2 behind now. Be up to date by the end of the week and I have also been furiously writing lots of ideas for future work. This happens whenever I go away - the creative side of my brain has time to work. Here's the man of the match. 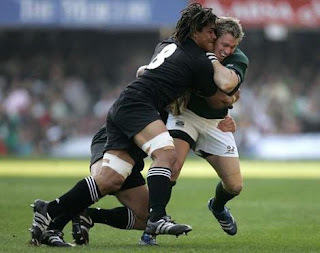 After a slow start the ABs beat the Springboxs so all is well in the land of rugby. 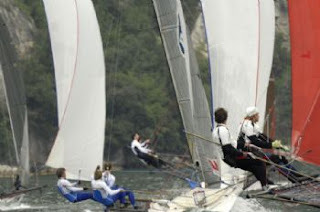 Not such a good day for Team NZ in the yachting though. We will be in Sydney in time to watch tonight's race. Flight time has just changed so off to finish the packing - gotta take my clothes and stuff as well. That's always very last and sometimes I dream that I have got somewhere without anything to wear. 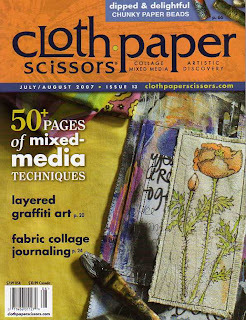 only taking my notebook for writing and my TASTs to stitch. And a book to read. See you next week or at the show - we are looking forward to visiting our favourite Indian restaurant. Here is Goodie Goodie Gumdrops finally all ready to go to the show and at the bottom is her special brooch. 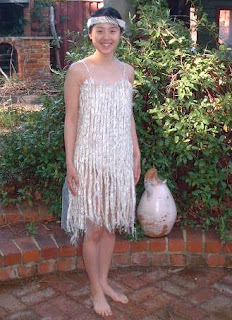 There is no machine or hand stitching on this garment by the way - the cami is from my book - all embellished between metallic netting, the bolero is knitted, the skirt is knitting and hand dyed lace and the brooch of course is knitting scraps and embellisher. 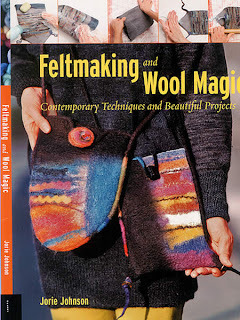 Her bag is also fron my book and is knitting and embellishing. The name is because when we were on Waiheke Island Ian got himself a Goodie Goodie Gumdrops icecream and me something else (not with such an exciting name) and didn't share a lick with me. Actually she looks a little dumpy on the dummy but she really is sleek unlike her maker. Wild and wintery day here today and every time Ian has climbed on the roof to clear the gutters, it has rained. A good day for packing suitcases and cleaning up. I am all ready to go away with a clean notebook waiting for me to fill it up with all the plans I have refused to acknowledge all week. But first we are off to Luigi and Martine's for yummy Italian food before we go to Bruce and Kazuko's to watch the rugby and the yachting. 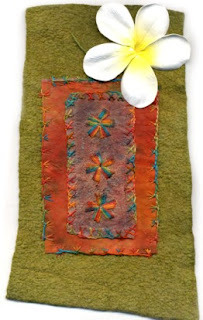 I got a lovely surprise in the post yesterday from Sarah Lechner - I bought one of her pieces of work - it is so inspiring and has given me ideas for what I night do next on my embellisher. 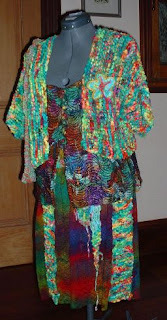 Art to Wear is nearly finished - she just needs a brooch and a belt so pic coming later. I have also packed 2 suitcases and done the washing and cleaned up part of my studio. How sanctimonious can one be? until the fat lady has finished singing. Watch this space in the morning. 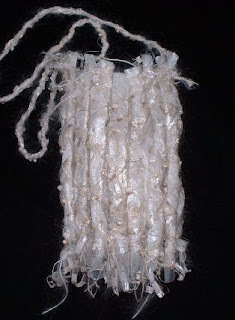 I have just had a brilliant idea for the skirt of my garment so I just need to execute it. Too many of you have too much faith in me - but the garland was completed and collected by the UPS man who came a little earlier than 3pm. This is a hint of it but if they don't like it you might never see any more. Once I have finished my skirt, I will be able to finish the packaging and packing of suitcases. Tomorrow is a very big night - the America's Cup final starts and it is actually on Fox Sports - and the All Blacks play their first game in the Tri Nations. The really big game is next Saturday though - ABs vs Wallabies. We will be out of that show like lightening to go watch. And we are having the most glorious rain here today. The brick fence between us and next door has been plastered and the fence at the front of our house is for next week. Very exciting - we have been waiting for a couple of years for this. The postie will be thrilled as he has been complaining about the size of our letterbox for a long time. He just throws the mail over the fence instead. Pics tomorrow. And just think - I am 3 TASTs behind. 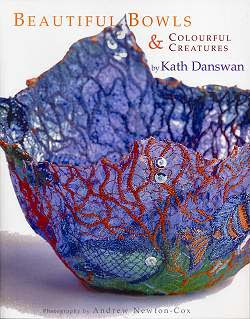 Kath Danswan's book - Beautiful Bowls and Colourful Creatures turned up today - they made a sea voyage from the UK but half of them have arrived safely - I guess the other half will follow soon. It's a very nice book indeed. My scanning hasn't improved but that's probably because I haven't been practising. However, the latest CPS - Issue 13 - arrived this afternoon and to be quite honest I need them like a hole in the head but I also knew it was coming and better for all of our customers that it came now and not while we are in Sydney. We will send them out tomorrow. I haven't even had time to open it up - only to scan the cover. Garland very slow progress - bolero has a back and half a front - skirt has nothing. Keep trying Dale. 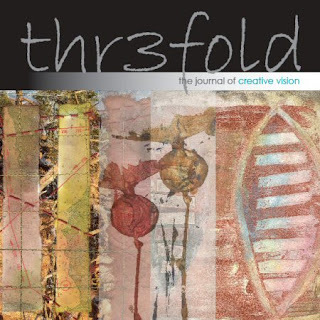 Thr3fold Journal - I have only read through the journal and not had a chance to view the CD - well not possible in bed at light's out. The journal part is beautifully written and is like a book - very thorough and well planned and thought out. I still think it is very expensive but probably worth a treat. You cannot view it as a magazine or you would never buy it. They have a great approach. There are plenty of how tos and the like around and it is nice to see something quite different on the market. I am trying not to panic - I do have branches and 6 flowers all made for my garland and a back and one quarter of a front of a bolero knitted (skirt still to consider then create). I decided to simply stay in bed for half an hour extra this morning for no particular reason so I got up at 6.30am. I am pacing myself this week to see it I get to Friday in a sane manner. I wasn't actually going to post today and was about to turn the computer off but Maggie Grey has just emailed me to say her blog is up and running which is excellent. Do go and visit her. I am off to bed to read my new piece of mail - thr3fld - the journal from Laura, Linda and Catherine. It was expensive. 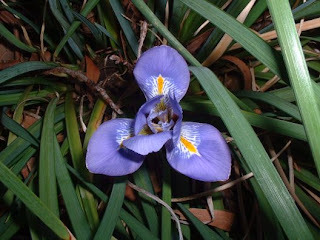 The first of our native irises is out. This is on what we call the Barbara bush - Barbara (our cat) used to always sleep in it and sadly that is where she rested for her final sleep so it's a bit special. I am not sure if the flower appearing means it is spring or what - we haven't quite had winter yet. I am pretty bogged down right now but it is all my own fault. I have this garland to make - I spent some of today (should have spent all of today but you know how it is when you keep putting something off) working on the bottom part which means at least that I know where I am going which does help. Of course the Husq thought it was too sophisticated for free machine zigzag and played up so I had to get out my trusty Bernina 1230, clean it and because I wasn't looking whilst it was bobbin winding, the thread got all jammed up down inside the machine. More wasted time. And the other thing is that I am not really sure what the garland would or should look like. It has to go on Friday so I am pleased that I have finally broken the back of it by making the branches so to speak. Flowers tomorrow and I am planning a plethora of different sorts. 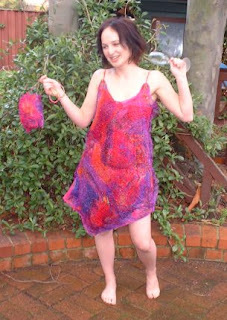 The other thing which has to be finished by Saturday is my Art to Wear - the cami is made (it's in the book) and the bolero is half knitted but the skirt - well...... Once again it's all my own fault. It will be done. I also have to write an article for a zine but Saturday as well. And package and pack some stuff yet for Sydney. At least we had a nice breakfast at the Merchant where we met Serena and Frank. And I got some lovely roses for the kitchen. Ian has been cleaning up the area outside teh studio. A little bit here and there and we will soon be ready to do the garden area. It will be lovely once it's all finished but that won't happen for a while. The front garden is the next big challenge once the fence has been plastered and stuff. 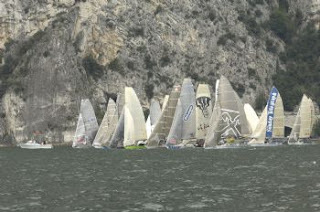 Grant, the lucky soul, is sailing on Lake Garda in the 18ft Skiff regatta. It is a wonderful place - we went to watch one year and wouldn't it be nice to go again. Here they are screaming along on De Longhi. 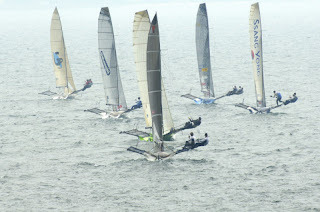 Lots of them sailing upwind - De Longhi is second from the left. A start but don't you love the back drop..
Grant in blue this year - they must all have new wet suits. All we have been doing today is packing boxes, loading the van and unpacking at the carriers. Now we are about to sit outside with a glass of wine to recover. A new excitement - apart from the bookcases, there is now NO stock in our bedroom - it is having a giant make over. 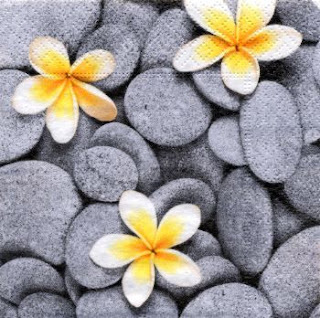 We will be able to luxuriate in the space. Tomorrow I am afraid it is all art to wear clothing and a garland. Sorry, Shirley, sometimes I talk to myself. We have a show in Sydney the last week in June at Darling Harbour, and I have been packaging and packing boxes for seemingly ages. Yesterday we were flat out packing all the boxes and filling a van and taking it to the carriers who train it over to Sydney. I went to help Ian unload the van - he packed it all onto palettes and then shrink wrapped it. What I didn't add was that we finally got to have our morning showers at 3.30pm so we felt justified in sitting out on our verandah watching the world go by, drinking a wine. We go to Sydney next Sunday with our gaggle of chocka blocka suitcases, and I still have an awful lot to do. I love shoes and had forgotten how much and how I have always loved then until a friend from years back asked me if I still bought shoes. Not quite as bad as Imelda. 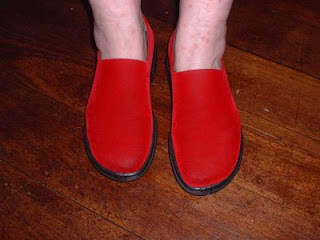 But NZ has always had some great shoemakers and this is my favourite red pair - Molly N - which I bought at the Merivale Mall in Christchurch on one of my trips back. (When we were students at Canterbury University we both lived in Merivale - different halves of a house - it has changed a bit now but it is interesting how you gravitate back to places you know) I was actually in the mall to use a public phone box to call Ian back here when I saw them in the window of a shoe shop while I was talking to him. 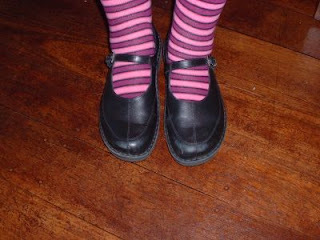 My friend Michael used to like this pair too and I wore them to his funeral because I was sure he would appreciate it. His niece did. They are red velvet. 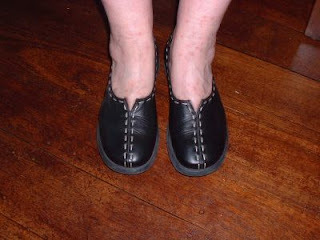 This is what I am wearing today - my Naots. And I like interesting socks too. Sarah Lawrence gave me this pair. Last night we went to an ACO concert. It wouldn't matter what they play - they are always wonderful. If you like and appreciate good music the ACO is the cream of the bunch. Last night had a fiddler and a folk singer as well - fantastico. These two little card holders arrived home today - they were for Quilting Arts a while back but didn't get there in time. You pull the cord and your card pops up. The top one is La Scala yarn stitched onto felt (this was made in the days before I got carried away with my embellisher.) 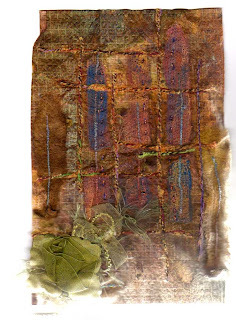 The bottom one is copper tissue punched with a daisy punch and stitched onto tissutex. 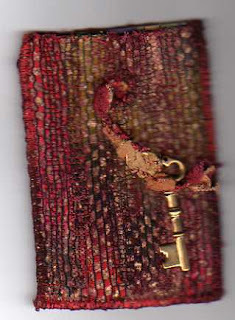 Penny - I use topstitch needles size 100 and never have any problems. Run your machine fast. All part of the ongoing flower series. It's always nice when things come back as you forget you have made them. Like cleaning up and finding treasures or garbage. You can see that I am still practising at scanning. Practice should make perfect until I get bored. I have spent quite a bit of time packaging Angelina for a big order today - horrible stuff - gets in everything (yes I KNOW it is wonderful for textile work)- anyway I can hear Ian with the vacuum cleaner as I type. I spent the morning packaging and packing machine threads for Sydney and I don't want to see them again until we arrive in Sydney to set up. This is a very boring week for packing the containers but it has to be done and I am only working in the mornings - famous last words.... On Friday night we will be bale to stop and take a breather. Just to show off my new scanning skills (why has it taken me so long to play - mainly because I haven't had access), I thought I would scan one of my favourite recipe books. 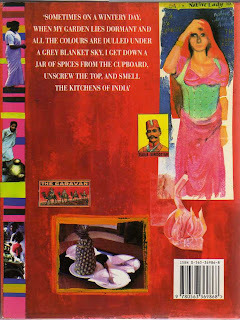 I love cooking (and we love eating) Indian food from way back when Ian had a Fijian Indian flatmate who introduced us to real Indian cooking after years of cold roast leftover lamb from Sunday lunch and Keen's curry powder with a few raisins. 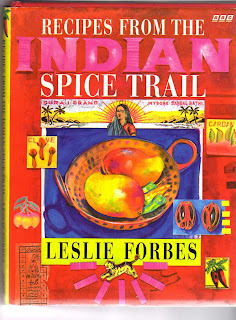 I got this book in 1994 - she has also written a fabulous one on Tuscan cooking which I picked up in Tuscany in 1992 - one of the earlier books to have a real journal flavour to it. We used the Tuscan one as a bit of a tour guide and even took it with us when we went back to Tuscany. I love recipe books but they are so much more than that and sometimes I don't actually cook much from them - just read them. 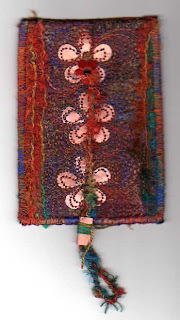 I have a fabulous Moroccan one in preparation for our trip to Marrakesh in October. The biggest worry for Ian at the moment is whether or not we will be able to watch the world rugby cup final as it is the very weekend we are in Marrakesh. Maybe one of the flash hotels has Fox or Sky or whatever. while thinking about the next project. I found this Qantas hand towel which I had used for mopping up and embellished a few bits and pieces onto it for a book cover. Being fibre it takes stuff easily. Then using our new printer - yeah - I scanned it all by myself. (Ian has the scanner at his computer and I never get a look in) Bit dark but you get the idea. 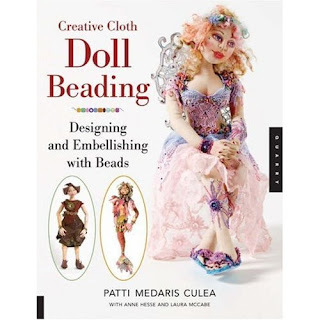 Two great new books arrived today - one is Patti Culea's new book on Doll Beading and in Patti's usual style it's pretty excellent and the other is Feltmaking and Wool Magic by Jorie Johnson - she taught in Perth a wee while back but I didn't get to go - it is quite a fabulous book for lots of ideas highly applicable to the embellisher as well. We are slowly getting all the new books up on the web. Retro Rags also arrived a wee while bag and it really is superb. I have made time to watch it. 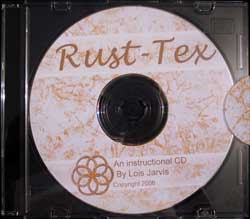 Also have a rust dvd coming very soon. There is plenty happening out there. At least I am now up to date with all the orders so can start the weekend with a clear conscience. I thought I would share the Virgin's sister with you today - every Virgin bride would be sure to have a sister - the one who is out for a good time. 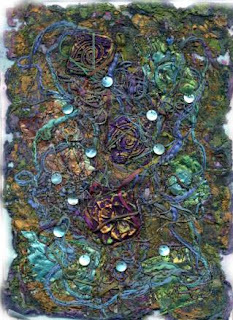 This litle number was worked on Romeo cold water soluble and the overlay is knotted wire - all done one year whilst watching a rubgy match at the pub - the days before Bruce and Kazuko got Fox - we can now exist on the before and after days. She spent some time with Opus touring around with their displays before she came home. They didn't want the Virgin Bride to accompany her. The play we went to last night - The Goat - was certainly rather whacko - not sure about the dead goat at the end - could smell a bit by the end of the series. Anyway it is good to go to a few plays - we used to go regularly and then got lazy or something. Actually nothing much creative happening here. I am almost up to date with the orders although last night I finished with 4 left to do and tonight I have 6 - how can this be? Tomorrow I will be really up to date and I really will get into the studio to get to work. 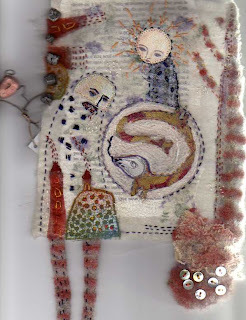 These creative thoughts don't go away and I want to try a few new ideas with the embellisher. 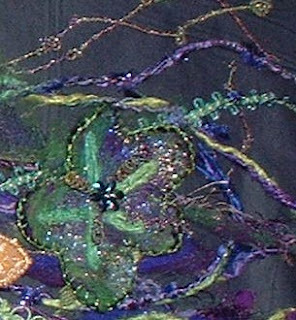 Wendy has loaned me an Xpression for as long as I like so I am back to having 2 embellishers again! I had put my Bernina 1230 up on the table for rapid free machine work. Nothing like having customised machinery. Off to a play tonight to see The Goat. Wasn't it absolutely wonderful that Team NZ won the challenge for the Americas Cup not that there was anything on the news here about it. Where is the Anzac spirit I ask? I wanted to post a pic of my feet with the still remaining sandfly bites but bossy Ian wouldn't let me - whose blog is it I ask? I must make sure that I take some anti sandfly stuff next year as my feet still look dreadful - not to mention my legs, arms, back etc. So much damage for such tiny creatures! We had a wonderful few days - just relaxing - only managed to read 2 books including Sebastian Faulkes new one - Enderby - which I really enjoyed. I have still got two to go though including Death in Brazil by Peter Robb which I started in Bintan - it is excellent too. Couldn't work on Generations as the battery on my 'puter was flat so should have left it at home. On Saturday morning we got brave and went on a flight over the Buccaneer Archipeligo - on a 5 seater plane - smallest I have been on is a DC3. The scenery was magnificent - such ancient land formations. We flew over the Horizontal Waterfall and cruised over the 1000 islands - well some of them. Saw pearl luggers and got some history as well. 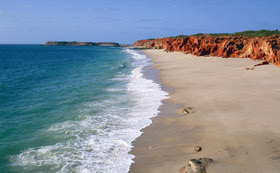 Then we landed at Cape Leveque for an hour. I can't seem to write in between the pics but the top one is the view from the restaurant and the bottom the beach where we didn't swim but dipped our feet in the water. Think we might go up there for a couple of days next year - it was wonderful. 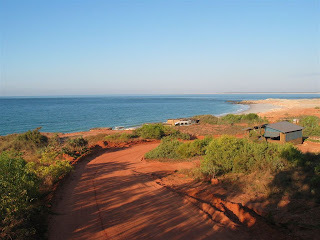 Then we flew back to Broome along the coast. In the afternoon we watched the ABs play France and the first half of the Wallabies against Wales - it got rather boring I must say and our red wine called to us so we wandered off to cook a bbq. Back home we have been flat out getting the orders underway but tomorrow I am hoping to get back to the studio for part of the day and get to work. 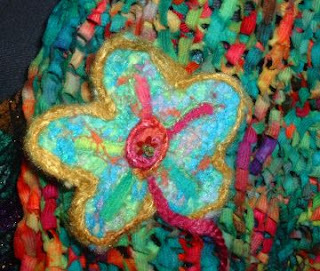 Lots of things to do - instead of finishing my bolero for my art to wear I unpicked it. Time to pick up the plot and get going. 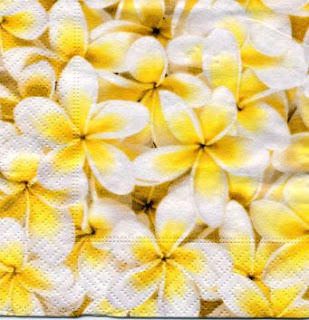 They must have seen me coming in Broome - lots of frangipani napkins for me to play with. It might be a while but I now have a new collection to add to my basket of fangipani goodies. Where we stayed they were everywhere and I picked up the ones that fell off the tree each day for display all around our villa. 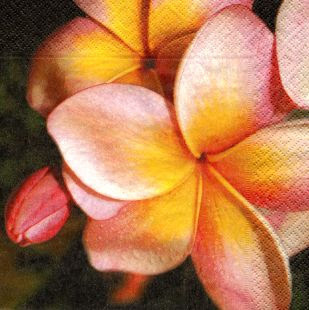 Three TASTs in one and since I was in Broome I chose Kimberley Dreaming threads to stitch with and a frangipani for my theme. And I found Broome full of plastic frangipanis this time. Must have seen me coming. So many people have sent emails which I have been reading each day and while waiting for Ian to return, thought I would say we are having a great time. Forgot to bring any cameras (tut tut) but we are relaxing and enjoying ourselves. Excellent time out. Lots of reading, sleeping in, swimming etc and a bit of trauma. The sandflies found me about 10 minutes after we arrived and now I look like someone with a disease - finally stopped itching but my legs are covered with what look like giant red welts. On night 2 a possum who was stuck in our outdoor shower (may have been there for a few days) was frenetic to get out and so loud we thought he was in our bathroom so we went to bed without cleaning our teeth or washing our faces. Poor little creature was rescued in the morning and seen sleeping peacefully up a tree. Then Ian went to the toilet in the middle of the night and lifted the lid to find a large frog. So it's all go go. Home tomorrow.